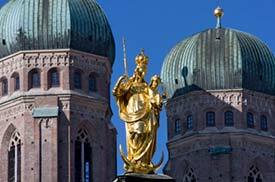 ABOVE: The twin domes of the Frauenkirche, Munich's cathedral, frame the gilded statue on the Mariensäule column in the Marienplatz. From the main railroad station, head up Bayerstrasse to the Karlsplatz (Stachus), then go down the escalator and through the underground passage to the inner-city Fussgangerzone or pedestrian zone. This is the main shopping district of the city, and its most prominent landmark is the Neues Rathaus (new city hall; see inset photo) on the Marienplatz. Here, you can climb 85 meters or 279 feet to a viewing platform in the ornate building's tower. The Neues Rathaus also has a Glockenspiel with mechanical dancers that perform at 11 a.m., 12 p.m., and (summer only) at 5 p.m. The Frauenkirche, a.k.a. the Church of Our Lady, is Munich's Roman Catholic cathedral. It's just off the main pedestrian thoroughfarer; turn left on the Augustinerstrasse as you walk up Kaufingerstrasse toward the Marienplatz. The church's interior is longer than a football field, and the south tower (which is open for visits much of the year) stands 99 meters or 325 feet above the cobblestoned streets. Munich has a number of other churches in the city center that are worth visiting. The most over-the-top, in terms of architecture, is the Asamkirche, with its fairy-tale Bavarian Baroque interior. It's easy to reach from the Marienplatz: from the U-Bahn station, follow Rosenstrasse one block to Sendlingerstrasse, then walk a few minutes down the latter street to the church. To the north of the pedestrian zone, the Residenz and the Nationaltheater (which offers daily tours) are popular with visitors. The Residenz was the seat of Bavaria's Wittelsbach dynasty for 400 years, and its attractions include the palace museum and royal treasury. Farther afield, parks such as the Englischer Garten and the Olympiapark offer pleasant recreation in the warmer months, and the Theresienweise comes alive with Oktoberfest in late September and early October. If you're a sports fan, you'll probably want to tour the Allianz Arena or (better yet) watch a football match that features one of Munich's two home teams: FC Bayern and TSV 1860. The trek to Schloss Nymphenburg is worthwhile if you're a fan of Baroque palaces and gardens such as the Munich Botanical Garden. You can reach Nymphenburg easily by tram or bus, and both the palace and park are open year-round. Other local attractions for your to-do list, if you have time, are Tierpark Hellabrunn (Munich's zoo) and Bavaria Filmstadt, Germany's answer to the Universal Studios tour in Hollywood. Viator, our sightseeing-tour partner, offers a variety of city tours and excursions that include "hop on, hop off" buses to major tourist attractions, bike rentals, beer and nightlife tours, and day trips (or even multi-day trips) to attractions such as the Hohenschwangau and Neuschwanstein Castles, Salzburg, and Rothenburg ob der Tauber. You can book online with Viator and pay in euros, pounds sterling, U.S. dollars, or Australian dollars. Mike's Bike Tours provides half- and full-day tours by bicycle. The Munich Tourist Office can give you information on other tour providers, or you can plan self-guided tours (such as an excursion to the Dachau Concentration Camp Memorial; see inset photo) by public transportation. Top and 2nd inset photos copyright © Oliver Raupach. 4th and 5th inset photos copyright © Arne Trautman. 6th inset photo copyright © Manfred Steinbach.